The touch control surface comes down to personal taste but this is a great sounding, compact interface. Neat, stylish design. Touch based operation. Driver free for Mac users. Delay in switching input types. LEDs could do with better colour coding. Audio interface designer Echo Audio has unveiled a new two-in, four-out USB compatible Echo 2 interface that shuns conventional controls for a touch based design. The impact of touch based devices has rippled way beyond the realms of the telecommunications industry. We took for granted how our phones and tablets shed most of their buttons some time ago, but the truth is that the majority of hardware audio devices still pack a collection of switches, sliders and knobs. Echo Audio has clearly decided that enough is enough, seeing how its new Echo 2 USB interface shuns conventional controls for a touch based design. The question is, does this represent pure gimmickry or a trail blazing road map for all interface designers henceforth? "As soon as the connections are made, operation is simple"
Echo 2 is slick and compact with a mini jack headphone port on the end facing toward you, and input and main outputs on the back panel. While the touch screen design ensures Echo 2's neatness, its box supplies assorted cable-based extras in the form of the all-important USB connector and two 1/4" to female XLR cables to facilitate microphone connections. Echo 2 is buss powered but you will need to connect the provided power supply to the mains if you want to use phantom power. Drivers for PC are available from Echo Audio's site. Mac-wise, the device is fully plug-and-play with no drivers required. 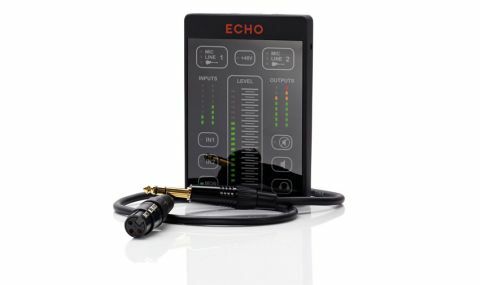 Once you're operational, Echo 2 offers recording clarity at up to 192kHz at 24-bit and the onboard signal conversion is of the high quality you would expect for an interface at this kind of price. As soon as the connections are made, operation is simple. Touch to select an input source then use the In1/2 buttons to pick an input before the long-throw Level control to manipulate input strength. Click the speaker icon to select output volume then utilise the Level dial to tweak to taste. There's a Monitor button in the bottom left-hand corner to control listening level, an automatic 'optimal' level set option, and, most brilliantly, a neat bracket in the box that lets you attach Echo 2 to a microphone stand. "The Echo 2 has the connections as well as the internal components to do a quality job both in the studio and as part of a live set"
There's no doubting the Echo 2 has the connections as well as the internal components to do a quality job both in the studio and as part of a live set, but does its touch-sensitive nature cut the mustard? Broadly speaking, yes, but with a couple of caveats. While the touch technology certainly works, in some cases it does so with a short delay. For instance, if you're switching input types for Input 1 or 2 you will need to touch the Input button and hold it before it switches over. Obviously this ensures you don't switch by accident, but it's a tad disconcerting at first because there's little in the manual to explain it. Equally, the audio conversion is of an impressive high quality and the upper panel's buttons self-explanatory, but we would like more colour coding in the LEDs to help differentiate between settings in low-light conditions. The phantom power light should be the standard red while output options, for instance, could be lit orange to differentiate them from the inputs. The lack of protruding buttons, dials and sliders makes Echo 2 a compact solution that's emminently baggable and with its audio interfacing credentials, Echo's latest is capable of a great sounding job. But is it for you? Well, that comes down to whether you're happy with touch controls. Like them - love this.